Some of you may recall the recent blog I did going over my aging biomarkers. If you didn’t read it, you can catch it right here. Towards the end of the blog, I discussed that one of the reasons my telomere test showed much better results than my DNA methylation test is that I fasted for 3.5 days in between the 2 tests. I also promised to tell you why this would have a beneficial effect on my telomere test…And here we are. In order to get a full grasp on how this works, we need to cover a couple things. First, we’ll cover telomeres and how they relate to age. Next, we’ll go over stem cells and their role in the body. Finally, we’ll mash the 2 together to go over the mechanisms by which prolonged fasting promotes longevity via the lengthening of telomeres. Our chromosomes contain the genetic blueprint to make our cells, and thus, our-selves. A damaged blueprint leads to damaged cells, which leads to damaged people. It’s very important to make sure that our chromosomes don’t get damaged to prevent diseases like cancer, and telomeres come to the rescue in this regard. Telomeres are little protective caps on the ends of chromosomes that prevent deterioration or fusion of frayed ends of DNA. Telomeres are essentially made out of the same building blocks as DNA, but they don’t actually contain blueprint information that’s translated in to the proteins that make you. Instead, they function to prevent damage to the usable portion of your DNA by acting as a sort of decoy for damaging molecules called reactive oxygen species(ROS), also known as free radicals. In addition to this role, telomeres function to protect the ends of DNA during the process of DNA replication. Our cells typically go through constant periods of replication where a parent cell divides and gives birth to 2 new daughter cells. During this process, the DNA from the parent cell must copy its DNA so that the daughter cells both have a set of instructions. This is how our cells replenish themselves. But this process isn’t perfect, and each time the DNA replication process happens, it stops short. As a result, we lose a little portion of DNA each time it replicates. If this were to happen to the portion of our DNA that contains instructions, we’d be screwed. Fortunately, telomeres sit in the perfect spot to take one for the team. So, each time our DNA replicates and our cells divide, our telomeres shorten a little bit. A common analogy for telomeres are the little caps on the end of shoestrings. If you lose the little caps at the end of your shoelaces, they’ll fray. 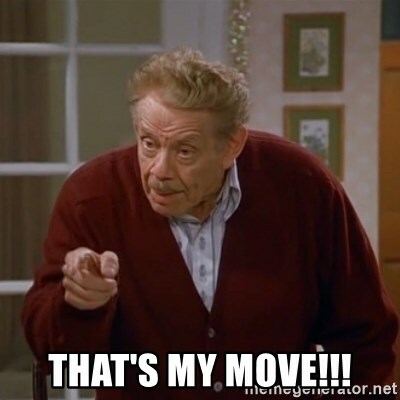 And just like shoelaces, if your telomeres wear down, your DNA will “fray”. As our cells divide more and we get older, our telomeres shorten. And once they reach a critically short length, our cells either undergo a programmed form of cell death called apoptosis, or enter a state where they no longer replicate called senescence. While they no longer divide, senescent cells are still there and secrete different molecules including inflammatory cytokines that can damage nearby cells. As we get older, these senescent cells contribute to the increased burden of inflammation often referred to as inflammaging. At this point, all’s not lost. Fortunately, there’s an enzyme called telomerase that can re-lengthen telomeres that are shortened during DNA replication. Unfortunately, not every cell in your body expresses telomerase, and as we get older the cells that do express telomerase express less of it. Over time, our ability to replenish our cells diminishes, our function declines, and we die. Luckily for us we have some cellular saviors called stem cells. Stem cells are the sentinel cells of our body. When our cells incur damage, stem cells swoop in and secrete proteins that initiate the repair process. When our cells die, they give birth to daughter cells that can replace the cells we lose through a process called differentiation. The great thing about stem cells is that they express telomerase, so they tend to maintain long telomeres. Additionally, cells that are born directly from stem cells likely have longer telomeres than cells that aren’t, based on the simple fact that they’re one cell division away from exposure to high levels of telomerase. Of course, as with everything else great, we lose stem cells as we grow older, primarily through apoptosis and senescence. But, the good thing about stem cells is that they aren’t a one-trick pony. In addition to differentiation in to other types of cells, they can also duplicate themselves through a process called self-renewal, creating more stem cells. And of course, these new stem cells also express telomerase, so their daughter cells will also have long telomeres. The image above illustrates the 3 forms of cell division that stem cells undergo. In asymmetrical division, a stem cell gives birth to a cloned stem cell and a daughter cell that forms part of a tissue. In the 2 forms of symmetrical division, a stem cell can either give birth to 2 clones of itself or 2 differentiated daughter cells. It’s important to keep in mind that there are many types of stem cells with differing levels of each of these 3 types of cell division. Stem cells can become many different types of cells in the body, but they’re limited to what they can become. For our discussion on stem cells, fasting and longevity, we’ll focus on 2 types: hematopoietic stem cells and mesenchymal stem cells. Hematopoietic stem cells(HSCs) are stem cells that give rise to the cells in your blood. They’re found in the red bone marrow and continually replenish your blood with red blood cells that carry oxygen and immune cells of the myeloid and lymphoid lineages. They have a high rate of self-renewal and express telomerase. 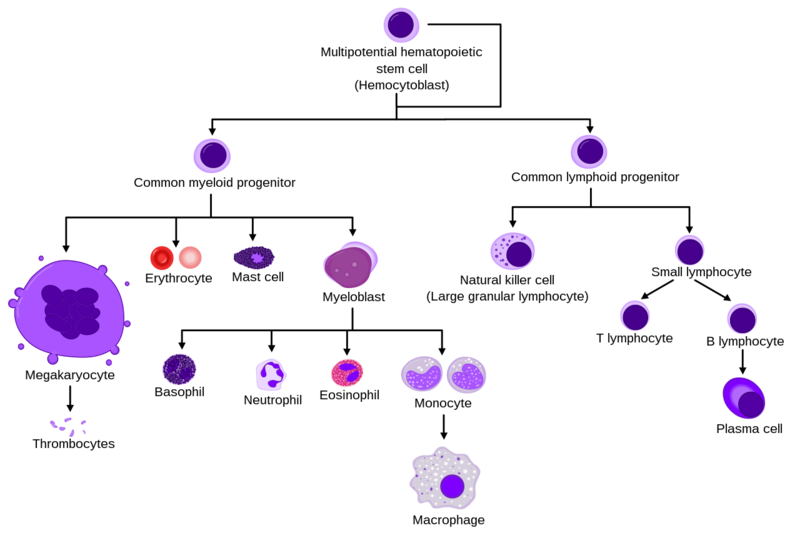 As you can see, a lot of different cell types can come from hematopoietic stem cells. An additional consideration is that as we age, the fate of our hematopoietic stem cells tends to skew more towards the myeloid lineage. This is one of the reasons our immune system begins to malfunction as we age, something we’ll be coming back to in a moment. 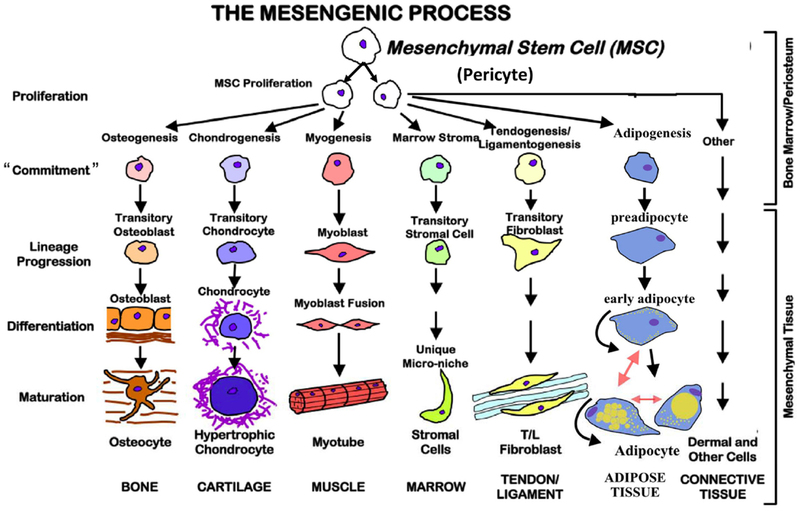 Mesenchymal stem cells(MSCs), on the other hand, differentiate in to bone, cartilage, muscle and fat cells. MSCs are primarily found in bone marrow, fat, umbilical cord cells, molar cells, amniotic fluid, and potentially the peripheral blood. 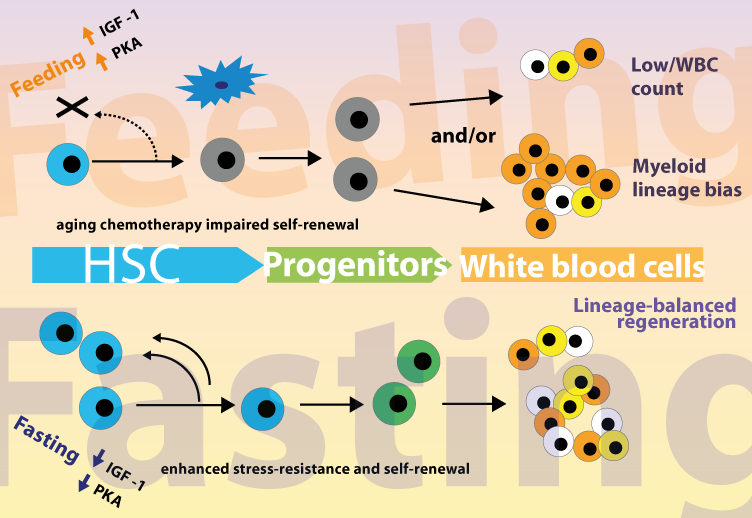 An important consideration in both of these illustrations is that once a cell is committed to a particular lineage via differentiation, it can no longer go back to being a stem cell. 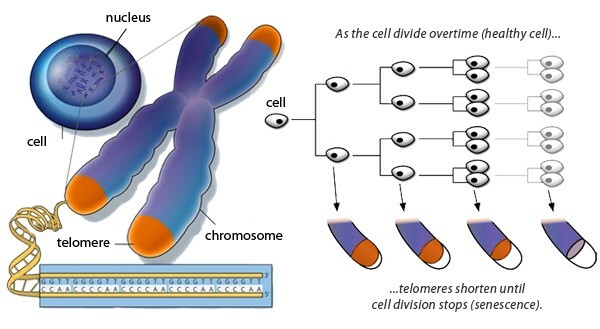 It’s also important to understand that as a cell moves along the path of differentiation, telomerase levels decrease and telomeres gradually shorten during each cell division. Unless you’ve been hiding under a rock for the last 5 years, you’re probably aware of the increased interest in intermittent fasting. Intermittent fasting is the periodic restriction of food and has many health benefits. most of which are coupled to circadian rhythms. While I won’t discount the benefits of intermittent fasting, it’s important to note that prolonged fasting, the restriction of food for 48+ hours at a time, has unique benefits that you won’t get from intermittent fasting. One of these unique benefits has a fairly substantial effect on the hematopoietic system. During prolonged fasting and the subsequent refeed, there’s a rejuvenating effect on the hematopoietic system in two ways. First, there’s an increase in the number of hematopoietic stem cells via stem cell self-renewal during the prolonged fast. Then, during the refeed, the cells differentiate and re-form the hematopoietic system. This brings us to the second beneficial effect on the hematopoietic system: a more balanced myeloid:lymphoid ratio. When the hematopoietic system regenerates, it resembles a more youthful myeloid:lymphoid ratio, and functions in a more youthful way. Although, it’s important to point out that diet quality likely plays a role in how long this youthful myeloid: lymphoid ratio persists, as the typical Western diet tends to skew the blood population towards the aging myeloid:lymphoid ratio. This may indicate that the Western diet is a major culprit in the aging myeloid:lymphoid shift in the first place. As you may have already guessed, the increased number of hematopoietic stem cells that comes with fasting likely has a large effect on the telomere length of the daughter cells created during the refeed. Think about it…more stem cells means more daughter cells from those stem cells. Daughter cells that come directly from stem cells are a step removed from telomerase, and therefore should have longer telomeres. So that’s the good news, but here’s the bad news: These results typically require a 3-5 day fast in humans…Or do they? The fasting mimicking diet: A valid alternative to fasting? With the many potential applications of fasting for improving longevity and the efficacy and side effects of cancer treatment, there’s been an interest in trying to generate the same benefits of fasting without eliminating nutrient intake. While I don’t believe that prolonged fasting for less than 5 days carries a substantial risk for healthy people, it’s probably not appropriate for the elderly or malnourished cancer patients. Enter the fasting mimicking diet. The fasting mimicking diet was developed by fasting researcher Dr. Valter Longo from the University of Southern California for the above purpose. The diet works by providing supplemental meals for 5 days a month and a normal diet for the remaining 25 days. The science behind the diet is fascinating, based primarily on attaining all the essential nutrients to promote health while eliminating nutrients that interact negatively with fasting pathways(mTOR, AMPK, Sirtuins, etc.). While all the science is great, most people only care about results, and luckily we have a clinical trial to look at. In a small pilot study with 19 participants, 3 cycles of the fasting mimicking diet led to a 7 fold increase in mesenchymal stem and progenitor cells after 3 cycles of the diet. Unfortunately, this increase was not considered significant due to the limited number of study participants. Therefore, a larger study is required to determine if these results are due to the diet or just random chance. In mice, the fasting mimicking diet recapitulated the results of fasting with respect to the improvement in the myeloid:lymphoid ratio, and they also showed a similar increase in mesenchymal stem and progenitor cells. This indicates that you may not need to go completely without food for days to reap the benefits of fasting, although the ProlonFMD isn’t cheap at $200/ 5 day cycle. Fasting provides multiple benefits for longevity and the placement of fasting firmly in the cultures that make up the Blue Zones indicates that it’s likely a beneficial strategy to promote longevity and healthspan. Of course, it’s important to not randomly pick and choose which aspects of Blue Zone lifestyles are important to longevity without scientific data to back them up. Fortunately there is a virtual treasure trove of different mechanisms through which fasting can positively influence health and promote longevity and these pathways appear to be conserved in all animals including humans. One of these mechanisms, re-population of the hematopoietic system to a more youthful type, likely has a positive impact on telomere length through increased stem cell renewal and differentiation. While it would be an overstatement that telomere shortening is the cause of aging, it’s certainly one of the issues that needs to be addressed for increased healthspan and longevity. In this way, fasting is a viable option to overcome the erosion of telomere length that comes with age. For people who find going without food for 3-5 days is too overhwhelming, the fasting mimicking diet from Prolon may be a viable alternative. Personally, I choose the former over the latter. This discussion is on prolonged multiday fasting with or without water.